I’ve got a number of things in progress right now which is a little unusual for me. I usually work through the process one step at a time, but right now I’ve got a little bit of stuff in each phase of the process. Shelves full of leatherhard stuff drying, greenware waiting to be bisqued, bisqued ware to be glazed and glazed waiting to be fired. Definitely not my normal process. Anyway, today the kiln is running with a glaze load. 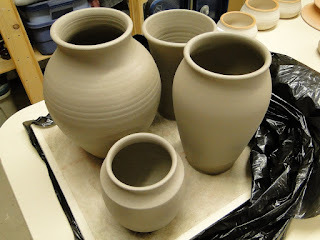 And I’ve thrown some vases from raku clay to used as samples for an upcoming horsehair raku project I’m working on. Here’s what I was listening to while working today. I love this Twin Cities group.